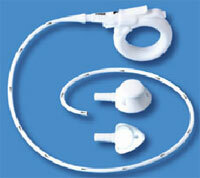 Gastric ring, tube of connection and 2 sizes different of plantable site. The surgery of obesity by adjustable gastric ring is intended to the patient presenting an excess of fatty mass dating of more than 5 years, having used and having misused of any kind of mode without success. Surgical operation acts under general anaesthesia and coelioscopy and lasts on average an hour. The hospitalization is from 24 to 48 H and the recovery of a normal activity is possible at the end of 3 to 4 days. The goal of this surgery which is completely reversible is to make it possible to lose 60% of its excess of weight in a progressive and continuous way over 18 months. The compartmentation of the stomach makes it possible to the patients to taste with all the mets in minor amount. It is the principle of the quantitative food restriction without real frustration. It is the equivalent of a mode hypocalorique without phenomenon of "yo yo". The tightening of the ring is remotely made intervention by the surgeon or the radiologist. It is done by simple percutaneous puncture with each time the weight loss stagnates over one 15 days period. The ring tightening is realized virtually by the surgeon or radiologist. It is carried out by centesis each time the weight loss stagnates over a 15 days period. Aged of 18 to 65 years. Have a serious degree of obesity with 1 IBM (Index of Body Mass) between 35 and 50 kg/m2. Ready to change past sanitation modes. Do not excessively drink alcohol or hypo-caloric drinks. A gastric ring girdling the upper part of the stomach, creating thus a gastric compartmentalization is in fact the driving force behind the occurrence of the "sand glass" phenomenon. This allows for the slowing of food passage and engenders a disgusting taste as soon as the small higher pocket of the stomach is filled. An anti-hunger feeling is then experienced. This is in fact the so-called “obesity-free rule of surgery without restrictions”.